Another year has passed…and I am using today to savor it month my month. As I wrote this post, a bluebird settled outside the window of my office - long enough to photograph through the window; so I'm sending off 2015 with a 'bluebird of happiness' in view. I find myself focusing on what was new (to me) in 2015 as I write this. I’ve indicated the ‘new’ in italics. In January we visited Tucson and made an overnight trip up to Montezuma’s Castle, Wapataki, Sunset Crater, Grand Canyon, Meteor Crater and then drove back through the White Mountains. There was a beautiful sunset on that drive back. We also enjoyed the butterflies and poison dart frogs in the conservatory at the Tucson Botanical Garden. I spent over a week in Texas – and enjoyed the birds at Josey Ranch as usual. During February, March and April I spent one day a week in Maryland Master Naturalist training. It served to update many things I learned in my college classes in biology in the early 70s! Jelly fungus was one bit of trivia I learned…and now I see them frequently. In April we spent days exploring wildlife refuges along the North Carolina coast and a little inland. It was the first time I’d seen river otters in the wild and a carcass being shared by a turkey and black vulture. 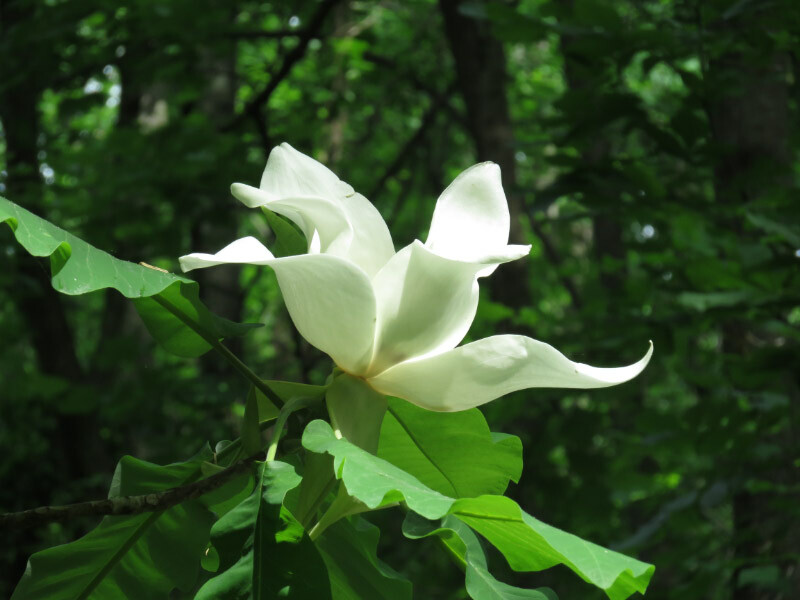 May a big month for hikes with elementary school field trips…and retracing steps to places discovered during the Master Naturalist class (like the grove of Bigleaf Magnolias near the boundary between Belmont and Patuxent Valley State Park). Somehow there were a lot of short trips in June…and associated discoveries: bird’s nest fungus at Centennial Park, the comfort of James Buchanan’s house in Lancaster (and the legacy his niece left to Johns Hopkins), the attention to detail of the DuPont that created Winterthur, and the Monticello structure upstairs that camouflaged the multiple floors and filled them with light too. 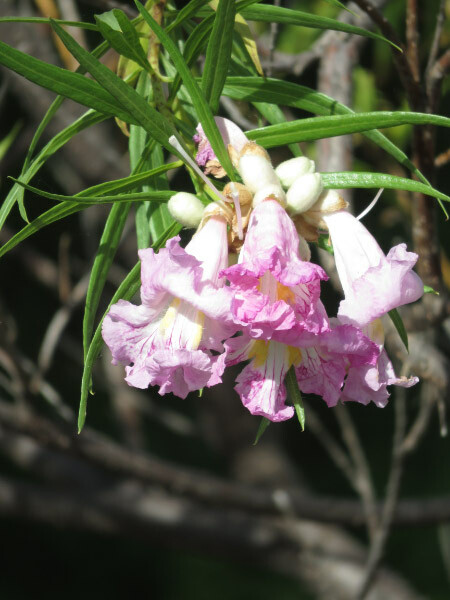 I was back in Texas again in July and the desert willows were blooming – otherwise it was too hot to do much outside. August was a busy month. I was thrilled that the elementary school aged campers enjoyed nature photography so much. We also made a tour of New York State Parks with waterfalls. Some we had been to before: Letchworth, Montour Falls, Taughannock, and Harry H. Treman. Stony Brook was the new one. The highlight at Longwood Gardens in September was the water lilies. In October – we went to our first Dark Sky Star Party at Staunton River State Park in Virginia. It was the first time we had camped in over 20 years too! The star party was followed by a tour through West Virginia to enjoy the fall foliage – partly via the Cass Scenic Railroad. October and November were filled with hikes with elementary school field trips….and swirling fall leaves. The end of year crescendo was our vacation to the Big Island of Hawaii. There were firsts at every turn on this trip. I also discovered a new source of free courses: edemy…and completed two of them! This is the third month for my Intimate Landscapes series (after reading Eliot Porter’s Intimate Landscapes book (available online here)) featuring images from December that are: smaller scale but not macro, multiple species, and artsy. This first image is from Hawaii – the very dense and green ground cover…with a few reds and a very black leaf that caught my attention. The camellia that was surrounded by ferns in Hawaii was an arrangement made my nature. Sometimes there were intimate landscapes in Hawaii that looked similar to ones seen in more temperate climates…but there is black lava underneath this grouping! Longwood Gardens paired white, green and red plants in their main conservatory. There was a large tiered fountain that had been repurposed for succulents. There large bowl with a variety of cactus…one of them with tiny blooms. Groupings of different pines made with their cones were also part of the natural decorations. None of these ‘intimate landscapes’ in the conservatory would have been together without the help of the gardeners…but I enjoyed them the same way I enjoy finding groupings outdoors. 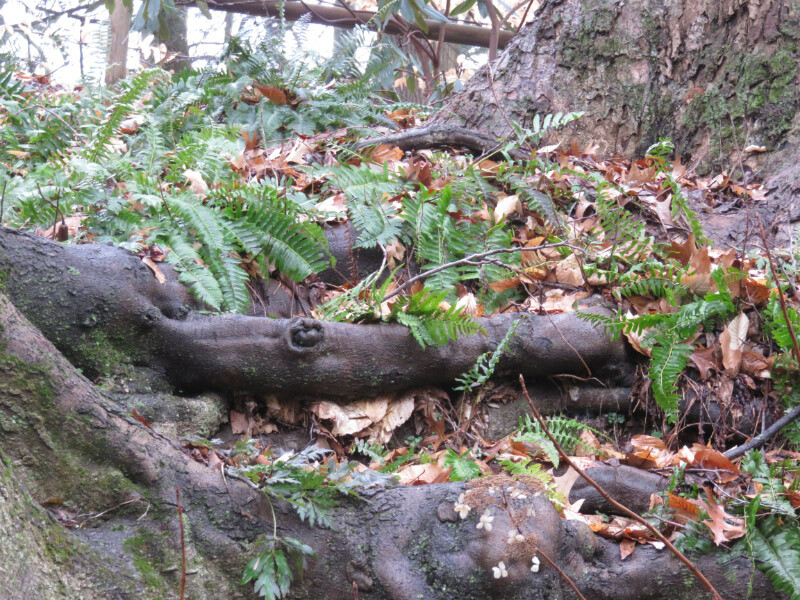 Last but not least – from outdoors at Longwood Gardens – ferns, moss, and dried leaves growing around the knotted roots of a beech tree. We took a helicopter ride to get a better look at volcanoes and waterfall….the overall terrain of the Big Island. It was quite an experience. My seat assignment was in the middle front (seating was three across in the front and 4 across in the back). We made a loop around the island over a two-hour period. A little over half way through we landed at the bottom of a 400-foot-high waterfall. A narrow strip of land divides the waterfall from the ocean. The land is privately owned so not something that can be seen except via a helicopter tour that has obtained permission. Afterwards we flew up one of the valleys and saw more waterfalls. Some of them were in areas that could be hiked…but they would definitely take a lot of energy to see and, based on my other experience in the rain forest, might be very difficult to see through all the foliage on the ground. The deep valleys stand out from the air and how neatly cultivates some areas are. Pineapple and sugar cane are no long the cash crops of the island. There are cattle ranches and eucalyptus forests…Kona is known for coffee…macadamia nuts near Hilo. The eye searches for man-made structures to provide scale to the scenes - bridges across deep valleys or the buildings of Hilo. On the lava fields and the shoreline, the edge of the forest provides a notion of scale but the power of lava to change the terrain is evident everywhere. There were tiny areas where flowing lava was visible before it flowed underneath solidified lava through a lava tube. At the end of the ride – we headed back to the helicopter base….made on an old lava flow. I missed the green already! Punalu’u Black Sand Beach does indeed have black sand! I took a jeweler’s loupe with me to the beach and took a picture of some grains of the sand through it with my husband holding the paper with the sand grains! They are bits of basalt – not as find as on most white sand beaches. This beach has even bigger rocks – not sand like at all like these grains. And ducks that are very acclimated to people. And a ocean crashing on some rock that still jutted out from the shore….wearing it way to form more grains on the black sand beach. There was a green turtle looking sleepily at the tourists. Just after this picture was taken, the turtle closed its eye completely. There were mynah birds around too. This one looks particularly alert and very serious. Our next stop was South Point – the southernmost point in the entire US. It was very windy so we didn’t stay long. Evidently at high tide – people jump from the top of the cliff and climb back up the rickety ladder afterwards. It was low tide when we were there and most people were like us – took a quick look around – and continued to their next destination. Our destination was Green Sand Beach. We paid to $15 to a local driver to take us over the very bump 2.5 miles to the beach and back. It was even windier than at South Point. We climbed down the cliff via a crevasse (mostly with secure footing); this is the picture from the bottom of the cliff with the crevasse we came down to the left and then angling back to the right going upward. My husband managed to find a small place sheltered from the wind so I could take the picture of the sand through the jeweler’s loupe. This is not a big beach and there are cautions to not take any of the sand away. The grains of greenish olivine are clearly visible….as are some other colors. The olivine is from the cinder cone that is eroding to form the beach. And down to the sea. Note the hair and clothes in this picture; everyone was being sandblasted! My husband’s glasses blew off as he was climbing back up the cliff; fortunately, my daughter was able to retrieve them. My hat pulled so hard at its tie that it now has new character! As I looked down at myself as we made the bump rid back, I realized that everywhere I had put sunscreen has a thin film of grit! The Puu Makaala Natural Area Reserve is a wet native forest on the Big Island of Hawaii. It was very near our rental house so was only a short outing. The route to the reserve is a narrow road that dead ends and then there is a short walk back along a fence to the reserve’s sign and a ladder stile to get yourself up and over the fence. Inside is a trail maintained by cutting the prolific vegetation – probably with a machete. The trees in the forest are koa and ohi’a but they are hard to see because there are so many tree ferns. The fronds are very large on these plants and it is easy to imagine what the understory of tropical forests must have been like during the time of the dinosaurs (in fact, limited visibility in this forest because of plant density makes one hyper conscious of the rustling noises in the foliage and glad that there is a fence to keep the wild pigs out). There was lots of moss around too and most of it seemed to include sporophytes. Most of the time, the view upward was filled with large ferns…but there was always a hint of the higher layers of the forest. I was only able to see the huge trunks of those larger trees. On the way back to the car – outside the fence – I notice some camellias that must have been planted along the road. The texture and color of the dried fern fronts with the flower that had recently fallen caught my attention…a nice ending to the outing. Violet Snail spends whole life drifting on self-made bubbles - A sea snail that floats around underneath bubbles….a pretty denizen of our oceans that preys on Portuguese man o’ war. There are twelve different kinds of rainbows – I was hoping there would a reference with pictures of the 12 different kinds…but it isn’t in this post. Ten Cool Thinks the Kitchen of the Future Will Do – Some things on this list don’t seem that great to me. Printing dinner with a countertop 3-D printer does not seem appetizing at all to me. 10 Truly Guilt-Free Wholefood Vegan Cookies - Many of these cookies look more appetizing to me than the bakery offerings I used to be drawn to. I recently had a slice of carrot cake and left half the icing on the plate because it seemed like there was more icing than cake! Treating colon cancer with vitamin A – As I read this article – I wondered if the vitamin A rich foods I love in my diet (and think of as ‘good’ for my eyes) are good for other reasons too. See nature in a whole new light – 17 pictures of bugs! A historical atlas of America, built for the 21st century – From the University of Richmond’s Digital Scholarship Lab….the site is called American Panorama: An Atlas of United States History. There are 4 maps now (the forced migration of enslaved people 1810-1860), the overland trails 1840-1860, foreign born population 1850-2010, and Canals 1820-1860) with more to come. This physicist makes dazzling snowflakes in his laboratory – Wonderful images…Ken Libbrecht has a snowflake machine and photographs the unique snowflakes it creates from water vapor condensing on a sapphire substrate. Cool roofs in China offer enhanced benefits during heat waves – As people put on new roofs….maybe the lighter colored roofs will become the norm on our warming planet. Festive underwater creatures look like mini Christmas trees – Even though the Christmas holiday is over…I couldn’t resist including these tropical worms that look like colorful Christmas tree bristles on their calcium carbonate bases. I enjoy the big celebrations of the year....but the little celebrations that happen daily are the ones that keep me going all year long. Here are my top 10 for December 2015….and – no surprise – they all are some aspect of the trip to Hawaii! 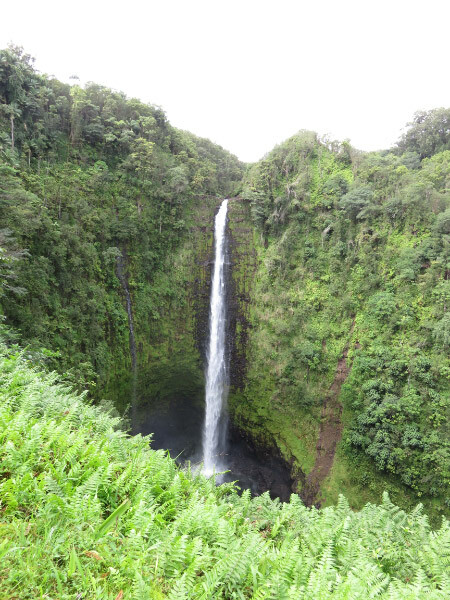 Akaka Falls State Park is a 400+ foot waterfall with a nice loop trail. The trail is paved which a good thing because the place is very wet; the penalty for stepping off is sinking into mud! The first view of the falls is partially obscured by foliage.Then there is a bend of the trail and more of the falls comes into view. Finally there is an overlook. I took several zoomed images as well. There are lots of smaller watercourses through the foliage too…the place is wet! And moss growing even on the metal railings of the path. There was a lizard eyeing us from leaves too. There were lots of different flowers too. The place is full of blooming plants. The Maunakea visit was probably the most planned day of our stay in Hawaii for several reasons. We had to rent a car from a local company that permitted taking the car up the mountain (the nationwide car rental companies don’t allow it) and we had to prepare ourselves for the altitude change. Our rental house was at about 3,000 feet; the Maunakea vistor center is at 9,200 feet and the summit (where the telescopes are) is at 14,000. We started our preparation for our Maunkea adventure the day before by taking a gingko supplement and planning our water supply. The next morning we got up and took another gingko and my daughter put us on a schedule for drinking water. We stopped at the Kipuka at the intersection of the saddle road and the road leading up the mountain. The side of the mountain above us. The road from the visitor information station and the telescopes is not paved and often bumpy. It requires a 4-wheel drive vehicle. At the top it is cold and windy. We were prepared with coats and gloves. Our original plan was to tour the Keck but it was not open when we were there but we drove around on the road connecting the telescopes taking pictures of them from the outside and down the mountain. It was bitterly cold and windy…and the altitude (14,000 feet!) made it hard to do anything quickly. We got our parking spot for sunset. There were other people with the same idea. Everyone huddled in their cars between forays to take pictures. The two round domes connected to each other are the Keck. The sunset at the cloud deck….and you see the mountains of Maui peeking through the clouds in the distance behind the telescopes. As we got ready to head down the mountain, we commented that it must have been too windy for the telescopes to open…..but as we made our way down the road our line of sight changed and we saw that one of the Keck’s had opened. Everyone is required to come down the mountain within 15 minutes of sunset. The visitor center hosts star viewing…..and then it is time to head for our vacation rental in Volcano HI. Lava Tree State Monument is a small park with a loop trail. The lava trees (molds of tree trunks formed when lava flowed through a forest) are older than the ones seen along Chain of Craters Road. Many of them were upright – look like totems, the hollow from where the tree trunk once was not visible. Many of the ohi’a lehu trees has ferns growing and other epiphytes growing on their shaggy trunks – those plants providing more green than the leaves from the tree. I had not seen mushrooms or shelf fungus in Hawaii until Lava Tree State Monument…and here they were brilliant orange. They reminded me of dried orange peel. Sometimes the trees must have been horizontal when the lava surrounded them. Some of the lava trees are mini-communities of small plants, lichen and moss. I was always startled by the orchids that thrive just about everywhere on the wet side of the island (i.e. the Hilo side…the Kona side is too dry for tropical plants except where extra water is provided by the resorts. Some of the lava trees are overgrown but the black – almost shiny – lava makes a stark contrast to the green plants. The route to the monument passes through Pahoa, the small town that was threatened by a lava flow in October-November 2014. The Hawaii Tropical Island is along the coast north of Hilo on the Big Island. The garden includes tropical plants from all over the world and is located on a cliff going down to sea level. The first part of the path is a boardwalk that is just wide enough for the golf carts that help people that cannot walk down (or back up) the garden paths. The understory of the forest is almost overwhelming with ferns – sometimes growing on soil but also coming from tree trunks too. Moss and vines grow on trees trunks too. Gold Dust Day Geckos (native of Madagascar) are colorful; they are easier to spot when they are not on foliage close to their own color. And a lot of flowers that I had only seen in Conservatories previous! The forest was shady for the most part but where the sun did make it through – the plants seemed to glow. And the streams through the garden were brimming with lush vegetation – sometimes almost like carpets. The surging for water against rock….on and on. And then we made the climb back up the cliff. The garden was a good place to be in the morning before the heat of the day. We covered exposed skin with sun screen and sprayed ourselves with bug repellent since we’d hear of Dengue Fever being a problem on the Big Island in the weeks before we arrived. The gift shop at the garden was good too….more on that when I summarize our purchases during the trip (later in this series). Chain of Craters Road extends from the Kilauea Caldera down to the sea in Hawaii’s Volcanoes National Park – an elevation change of about 3,700 feet in just under 19 miles of roadway. There are stops along the way….and some ‘road trip’ type pictures through the car’s windshield. And epiphytes covering trees that are not doing so well. Any color change from black or gray is noticeable. This is a ‘lava tree’ where lava surrounded a tree and cooled enough to retrain the shape of the trunk before the tree burned away completely. Sometimes there are collection of glassy blobs – shiny and different colors from the surrounding lava. The color differences may be caused by different cooling rates or mineral content of the lava. There are craters along the road. Some are quite old with light gray lava and tress clinging to the sides. And then there is a stretch where there is fresher lava on both sides of the road. Mauna Ulu is the background of this picture. As we drove down the cliff to the sea – it was clear where lava falls has gone over the surface and down to the sea. There was a road cut through one such flow. Seeing this – I wondered why the majority of Hawaiian beaches are not black sand! The future of medicine is testing our body fluids at home – Will the ‘annual physical’ become a thing of the past as this testing becomes more widely available? The Coming Winter Part Two: The Elephant in the Room – The second part of Dan Satterfield’s explanation of the long range forecast for the winter. Living Alone Now the Most Common Type of Household – Analysis of US households from 1930-2010. The over 60 population accounts for the majority of population that lives alone so the expectation is that the number of ‘living alone’ households will continue to increase. Storing Electricity in Paper – Made from nanocellulose and a conductive polymer….the basic research is promising…not to develop a production method for the power paper. Improving Tools for Quantifying the Effectiveness of Conservation – Trying to quantify the effectiveness of conservation efforts is hard. This post is about the work of environmental economists to do it. Pesticide found in milk decades ago may be associated with signs of Parkinson’s – I was reading this article while I was in Hawaii…and that is where the study was done. The pesticide heptachlor epoxide was used in the pineapple fields in the early 1980s in Hawaii and made its way into milk of that era in Hawaii. Top 10 Winter Wildlife Experiences to Enjoy near You – Some ideas for getting outdoors in the winter. My husband and I are planning several jaunts to Conawingo Dam to photograph bald eagles this winter. And if we get snow (so far we have had a very warm winter hear in Maryland), we’ll look for tracks and look for wildlife in the morning/evening around our house. Explore Machu Picchu in Google Maps Street View and Artifacts from Machu Picchu from Google’s Cultural Institute – Another place for virtual travel. One Million Icequakes – Data was collected from a glacier in Greenland for 2 years…one that produced 20 icequakes every 60 seconds. The icequakes offer a window into the glacier bed where the ice meets the sediment. The first small hikes that we did at Volcano National Park were two that share a parking area: Thurston Lava Tube (Nahuku) and Kilauea Iki. And ferns and moss that are colonizing the lava at the entrance to the tunnel. The hike to Kilauea Iki – a cooled lava lake – begins at the rim of the crater in the rainforest. The path proceeds down a series of switchbacks. The ferns are at eye level. I captured quite an array of fiddleheads – purple, green, encased in a brown husk, hairy. And then the trail emerges from the forest onto the lava lake. The trail here is marked with stakes of rocks on the undulating terrain of solidified lava. Do you see the people along the trail? That provides a sense of scale for the place. The lake was formed in 1959 – so a relatively young volcanic feature. Ohi’a lehua have colonized the edge of the lava lake. Ohelo are there as well. This one does not have any red berries. The Nene (Hawaiian goose) evidently like the berries. The Ae ferns area also hardy colonizers of the lava. At one edge of the lava lake there are steam vents. We didn’t hike all the way across the lake…climbing back up the trail to the parking lot through the forest. Here is the view from after we reached the top. Our longest distance travel for the year was to the Big Island of Hawaii this month. We flew from Baltimore to Minneapolis to Honolulu to Kona…and it took almost the whole day. We left our house just after 6 AM EST and got into the Kona airport well after sunset. I saw the boundary between the western coast of the US and then the Pacific Ocean. It seem abrupt and I decided to read rather than look down at the ocean. As we got closer – I began to take pictures of the islands as we flew into Honolulu. It was easy to see where the water was shallow…where it got deeper. Oahu has some very dense development. But there are still parts where the mountains come down to the sea. We had a little time in the Honolulu airport. We bought dinner just before all the restaurants closed for the night! We flew over to Kona after dark and walked into the steamy terminal - covered but open air. Our baggage came quickly; I barely had time to photograph a large snail in one of the planters. And so our Hawaiian adventure began! There have been a lot of photographic opportunities these last few weeks…including a trip to the Hawaii (the Big Island). I have a series of blog posts on the trip that I am working on but this Zooming post (images 2-8) is a preview of some Hawaii images. Put cards under the plastic on the breakfast table. But that is it for decorating this year. We just got back from more than a week in Hawaii (blog posts to come about that) and are planning day trips to other places (Longwood Gardens, Brookside, etc.) that are decorated for the season through early January. It is a different plan for the holiday (Thanksgiving – Christmas – New Years). There is less decorating, more time with family and more time traveling! Wrapped gifts are not on the agenda at all. My husband gave me a binocular harness strap before we went to Hawaii and he bought himself more gear for star parties that are in our future! I’m still thinking about what traditions I want to squeeze back into the plan….maybe pumpkin custard for Christmas day…putting away all the decorations we did get out on New Years Eve. I check my refrigerator and pantry – picking a protein and vegetables. And then I think about the broth. The protein is generally something left over that I need to use up (like roast or lunch meat) or frozen edamame, or nuts (dry roasted peanuts or soy beans or my favorites). Sometimes I use quinoa as the protein source. I try to pick veggies that will hold up to being in soup. I particularly like carrots and Brussel sprouts and bell pepper…and some of the stronger greens like beet tops or kale. I still have frozen whole tomatoes that are excellent thawed to enrich winter soups. Sometimes I cut up sweet potatoes to use instead of carrots. Onions and garlic can be cut up fresh or added in dry form. If I use them fresh I like to sauté them before adding the broth. In fact – many of the veggies can be sautéed before the broth is added. Broths can be made a number of ways. I sometimes start with whatever is hot in the tea pot (tea, ginger water, cinnamon water, etc.) then I add seasonings or a bouillon cube…or let the meat I am adding provide the flavor and seasoning. My favorite seasonings (other than garlic and onion) are oregano, thyme, basil….or curry. I don’t make cream soups very often but that doesn’t mean I don’t have thick pureed type soups. I like butternut squash soup with curry seasoning. Two ways to prepare it: 1) cook the squash directly in the broth and then mash it in the pan or 2) use squash cooked previously that is already pureed when I add it to the broth. The bright green of edamame added as the protein makes a very colorful soup…..or dry roasted peanuts if the bright colors are overwhelming. Enjoy a warm bowl of December soup! Like last month – one of the ‘books’ I picked for December was one referenced in the Ancient Egypt course from Coursera that I completed back in November; the follow up reading spilled into December. It was a challenge not to pick a book that included botanical prints…I switched to birds this month but couldn’t resist picking an artist (Charles Demuth) that did a lot of plant paint! Haskell, Barbara. Charles Demuth. New York: Whitney Museum of Art. 1987. Available from the Internet Archive here. The title of the painting that I am including in this post (partial) is “From the Kitchen Garden.” The topics of his paintings included other topics too….a snapshot of different perspectives of the US and Europe in the first thirds of the 1900s. The British Museum. Mummy: The Inside Story. Available from the Internet Archive’s Wayback Machine here. The mummy in this case is Nesperennub, a priest who lived at Karnak (Egypt) in 800 BC. The site is a series of slides (with pictures and explanatory text) about the modern way that mummies are studied….not by unwrapping. One of the amulets found near the neck of this money was a wedjat eye. One from another mummy was included in the images and clipped a portion for this post. Unfortunately – this site was removed from the The British Museum’s site when it was reorganized so now it is only available via the Wayback Machine. There are two other online tours (Cleopatra and Egypt in the Old Kingdom) that can be found by clicking on the ‘Egypt’ link just above the ‘slide’ portion of the screen. Keulemans, John Gerrard. Onze volgels in huis en tuin – Volume 1. Leyden: P.W.M. Trap. 1869. Available from Internet Archive here. Keulemans (1942-1912) is a well-known bird illustrator and this is one of his earlier works – in his native Dutch. I was looking at it for the illustrations rather than the text. There are two other volumes available on the Internet Archive (volume 2 and volume 3) that I have yet to read…and I’m going to look at other books that might be online that he illustrated. According to Wikipedia, his total output includes over 4,000 published images – virtually all before 1915 so not in copyright. Enjoy good visuals and good reads! Women don beards for documentary about inequality in the geosciences – This documentary is about women in paleontology but the challenges faced by women in any field that is overwhelmingly dominated by men are similar. The ‘beard’ is a fun visualization! It reminded me of the female pharaoh that wore a beard. Report: China Clean Energy Investments Beat U.S., U.K, and France Combined – Hmm. Maybe the whole world is getting more focused on the challenges we have re climate change. It would be great if the US could be a leader…sad if we abdicate. How will future archaeologists study us? – CDs last 2-5 years before they risk losing data. This article is about encoding information on DNA and storing it in glass particles…artificial fossils. Of course – they may also find our landfills to be sources of information of how we really lived. Some Thoughts about the Coming Winter: Part One – The further out a forecast is – the less accurate it is. The post from Dan Satterfield explains why…some graphics about weather model results. Failing phytoplankton, failing oxygen: Global warming disaster could suffocate life on planet Earth – I’ve often wondered what happens to oxygen levels as the Earth’s temperature climbs. This is on scenario…and a scary one. If we have a 6 degree Celsius increase in the water temperature of the oceans – which some models predict by 2100 – the photosynthesis of phytoplankton in the oceans could be disrupted. Two-thirds of the planet’s total atmospheric ocean is produced by phytoplankton. Photographer Captures Stunning South Korean Landscapes Reflected in Mirror-Like Lakes – Some beautiful images. I like reflections….and I need to be observant to find them and photograph them. I always try at Centennial Lake (image to the left) but there are other places that I probably overlook completely. The Unregulation of Biotech Crops – In some ways – this situation is similar to the designer performance enhancement drugs that are hard to test for too. Modern techniques are streaming ahead – creating things we have little ability to understand very well – let along any unintended consequences. Physicians and burnout: It’s getting worse – This was a frustrating article. It reported the burnout statistics comparing 2011 to 2014 but no deep understanding for why burnout is increasing. I am not particularly happy with the US health system either but any attempts to change it very much seem to be impossible politically. DIY: Cinn-Apple Ornaments – One of my daughter’s friends made and gave us some of these ornaments for Christmas …probably about 15 years ago. I carefully put them away at the end of each season and they still smell like cinnamon every time I get them out! I’m not going to make any this year but I may do it next year and put them on every knob in the house! Eat a paleo peach: First fossil peaches discovered in southwest China – Peach pits that are 2.5 million years old! The peaches from this time period would have been about the size of the smallest commercial peaches of today.